The Australian Competition and Consumer Commission Chairman Rod Sims announced at the ACCC/AER Regulatory Conference dinner that the ACCC’s next market study will focus on the Australian communications sector. The market study will examine a wide range of issues concerning competition and efficiency in communications markets and will involve consultation with industry participants and consumers. Mr Sims said Australia is witnessing a significant change in the way communications occur. “Rapidly evolving technological developments, structural change within the sector, product innovation, and changing consumer preferences are all contributing to this change,” ACCC Chairman Rod Sims said. Mr Sims said the market study provides an opportunity for the ACCC to conduct research and listen to various views on technological developments and emerging trends. “We recognise the communications sector is one that all Australians have an interest in, and one that facilitates economic growth. Importantly, the study will also allow the ACCC to consider a wide range of interrelated issues that have been raised by the sector and that go to the proper functioning of the market. “The study will examine the changing landscape and identify any issues preventing the use of innovation and investment to deliver the benefits of competition to consumers,” Mr Sims said. 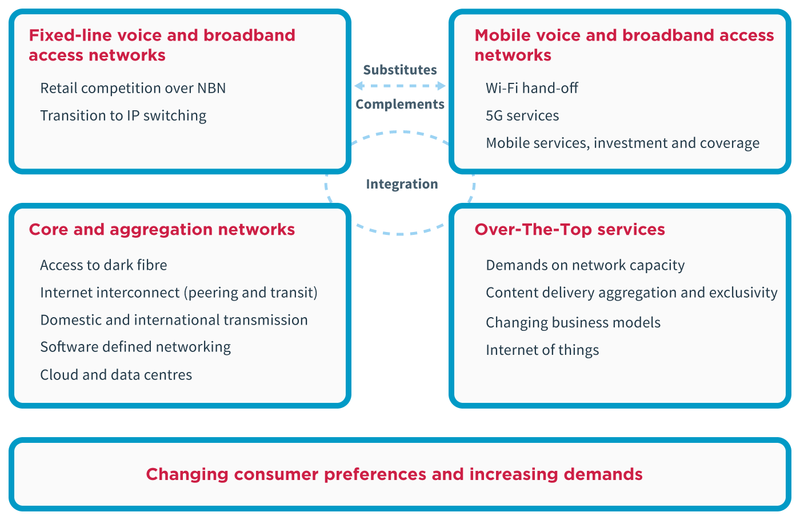 The changing structure of communications markets, particularly the transition to a fixed-line market in which NBN Co is the wholesale provider to retail service providers, and consolidation and market concentration within the retail sector. The growth in availability of services provided ‘over the top’ (OTT) using the internet as a delivery platform. These services include social network platforms, communications and marketplace apps. The exponential growth in the demand for bandwidth and data in recent years, largely reflecting the emergence of streaming music and video content services, placing significant demands on network capacity. The increased use of mobile data by consumers and the increasing preference for mobile as a way to access the internet. The availability of WiFi services is also facilitating the use of mobile services and further improvements are anticipated with the deployment of 5G. The market study will consider how these and other changes affect competition, the efficient operation of markets, and investment incentives. The study will examine options to address any issues identified, and it will also consider the potential to improve economic regulation where warranted. The ACCC will commence consultation with an issues paper and will release a draft of its findings for comment prior to completing the market study in 2017. The ACCC uses market studies for a variety of reasons to support its various functions. These include improving the ACCC’s understanding of a specific sector. Market studies enable the identification of competition issues, market problems, and possible solutions. Alternately, a market study may confirm competition in the relevant markets is functioning effectively and no action is needed. The Australian communications sector is going through significant change. In addition to global developments in technology and product innovation, the Australian industry is experiencing major structural change as the NBN is deployed and consumer preferences for, and use of, communications services change. The purpose of a market study of the Australian communications sector is to ensure the implications of these developments are well understood, to identify issues that prevent relevant markets from delivering economically efficient and competitive outcomes in the interests of consumers and to identify options, if required, to address these issues. Identify current and emerging trends and issues that are likely to significantly affect the efficiency and level of competition in relevant communication markets over the next three to five years, including issues associated with market power and the consequences of it being exercised. Consider the effect of consolidation, structural change and emerging business models in the Australian communications sector on efficiency and competition. Consider whether the transparency and comparability of consumer product information and costs of switching service provider impede competitive outcomes. The market study will not examine issues which are the subject of other concurrent inquiries into specific communication issues, including the Productivity Commission inquiry into the future direction of the Universal Service Obligation. Market studies complement the work done by the ACCC to ensure markets operate efficiently and competitively, in the interests of Australian consumers. This communications market study is an opportunity for the ACCC to take stock of significant change in a sector that underpins the digital economy and contributes to Australia’s economic growth. More than 440 regulatory experts will attend the ACCC/AER being held in Brisbane on Thursday and Friday this week. With sweeping changes occurring in energy, communications and other key infrastructure sectors, the conference will examine the future of economic infrastructure regulation and whether the conventional wisdom still applies. The annual event, now in its 18th year, brings together specialists from government, regulatory bodies and the private sector. It includes regulatory perspectives from the United States, United Kingdom, New Zealand and Canada.